Home > Science > Nature > How Do Tornadoes Form? “By the (Winds) Sent Forth One after another (to man’s profit); Which then blow violently. In tempestuous Gusts (Hurricanes), And scatter (things) far & wide. Then separate them. One from another. Then spread abroad a Message.” (Surat Al-Mursalat 77: 1-5). Tornadoes are the most violent storms on Earth, with wind velocities that can exceed 320 km per hour. How do these terrifying cyclones form? They can be detected before or as they occur through the use of Pulse-Doppler radar by recognizing patterns in velocity and reflectivity data, such as hook echoes or debris balls, as well as through the efforts of storm spotters. It is important to never confuse a tornado with a hurricane or other tropical cyclone because tornadoes and hurricanes are very different phenomena. Perhaps the only similarity between them is that they both contain strong rotating winds that can cause damage. Hurricanes always rotate counterclockwise in the northern hemisphere (clockwise in the southern), the direction of their rotation being determined by the Earth’s rotation. This is almost always true of tornadoes too, although on rare occasions “anticyclonic” tornadoes spinning in the opposite direction do occur (tornadic circulation is determined by the local winds). This is where the similarities end. 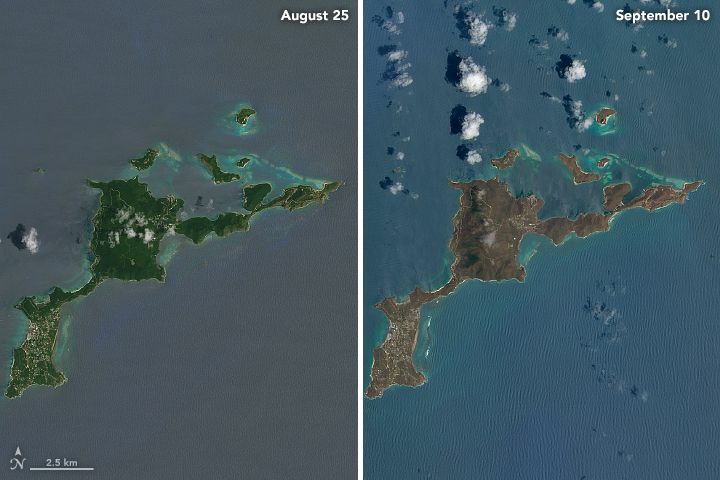 The Virgin Islands before and after Hurricane Irma hit. On the other side, there are many differences between tornadoes and hurricanes. The largest tornado ever observed was 4 km wide, and most tornadoes are < 0.8 km. The parent storm clouds that produce tornadoes are generally about 16 km wide. Hurricanes, however, are typically much larger, ranging from about 160 km to 1,600 km wide. A tornado’s lifetime is short, ranging from a few seconds to a few hours. By contrast, a hurricane’s life cycle can last from days to weeks. Tornadoes, and the parent storm clouds that produce them, require strong vertical wind shear and strong horizontal temperature changes to form and survive; hurricanes thrive in regions of weak vertical wind shear where the horizontal change in atmospheric temperature is small. Hurricane Irma’s low pressure sucked the ocean away at the Bahamas. Also, strong tornadoes usually occur over land, while hurricanes almost always form over the ocean. Finally, the strongest tornadoes can have wind speeds over 483 kph. But even the strongest hurricanes rarely produce wind speeds over 322 kph. On the other hand, a typhoon, a cyclone, a tropical superstorm are all no more than synonymous for the same natural phenomenon, a hurricane. In this TED-Ed short cartoon documentary, meteorologist James Spann sheds light on the lifespan of tornadoes as they go from supercell thunderstorms to terrible twisters before eventually dissolving back into thin air. TED is a media organization which posts talks online for free distribution, under the slogan “ideas worth spreading”. TED was founded in February 1984 as a conference, which has been held annually since 1990. This video is one of the series of TED-Ed Original lessons which feature the words and ideas of educators brought to life by professional animators. 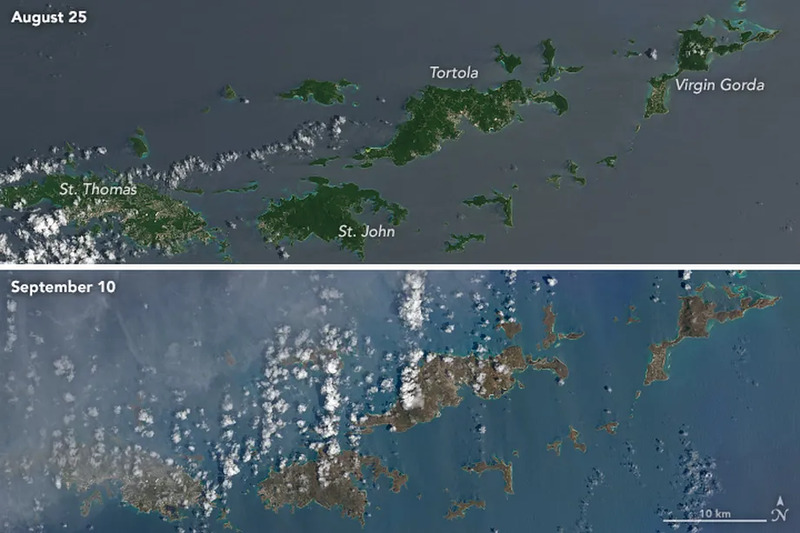 The island Virgin Gorda before and after Hurricane Irma.